Have you ever been to Germany in winter? Then I put my betting pants on and say you were on a German Christmas Market, too! Am I right?? If your answer to both questions is no, don’t fear! I got you covered with this post on the German Christmas Market. Obviously, Germany is famous for having Christmas Markets. So, let’s stroll the German Christmas Market together, shall we? Wait! What is a German Christmas Market? Oookaay. First things first. Most German towns hold a special market in Advent. It can go for weeks or – in small towns – a weekend or Sunday only. On any German Christmas Market, you’ll find a lot of wooden booths that sell handmade goods or food. To be honest: It’s the food that has me going to the Christmas Market each year. But you can take home many handmade items, clothes, or delicious food gifts for your loved ones or yourself, too! For years, the two German cities Dresden and Bautzen have been fighting about where the very first Christmas market was held. They both won, kind of. But officially, Bautzen was named the first place that ever held a Christmas market. That was in 1384 when Bautzen had an Advent meat and food market. Most Christmas Markets come to an end a few days before Christmas Eve. 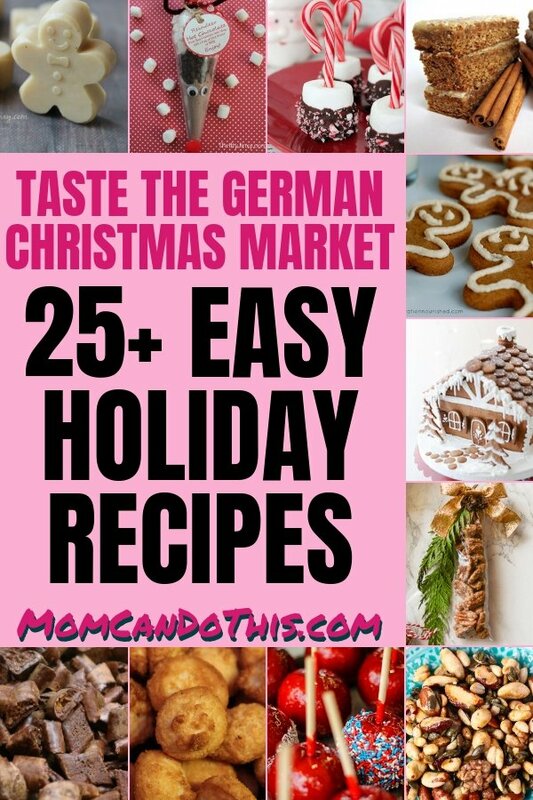 If you don’t have a German Christkindlmarket near you to stroll, I got you covered with this epic post that contains a ton of tasty recipes to bring the German Christmas Market to your home this season! Guten Appetit! There is a huge list of recipes coming. 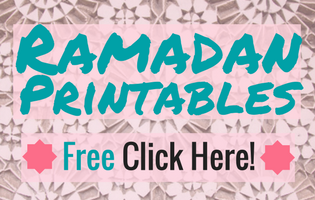 Or click through to each recipe you fancy to save a single recipe from the blogger who shared it! Well, as Christmas is in winter around here it can get pretty chilly if you hang around in the open all day. You better have your winter clothes ready! Wrap up in fine warm winter clothes and you are well-prepared to spend a few hours in the cold, moving slowly at best. Or standing at one of the many market booths. Go late to see those lights glowing in the dark!! If not, have breakfast. 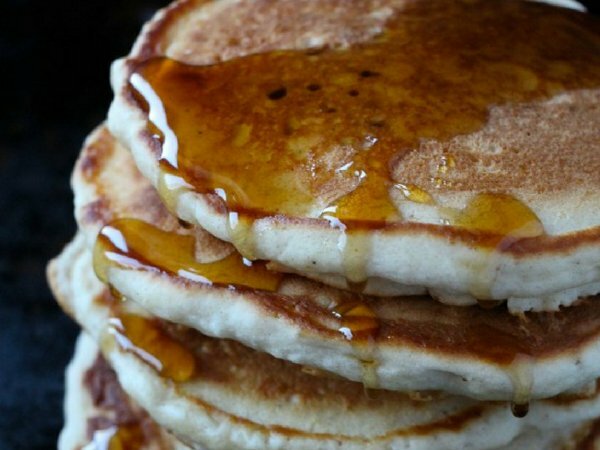 Why not try eggnog pancakes using this recipe shared by Mission To Save? Photo by Mission To Save. Maybe you prefer something hearty. 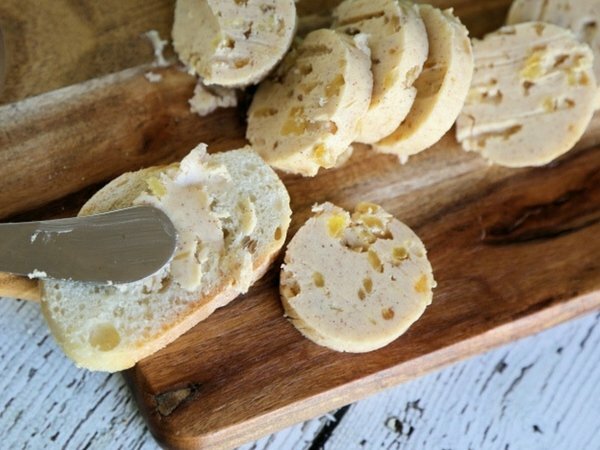 I love spiced butter, especially with herbs and lots of garlic. This would not be a great start to a day strolling the crowded Christmas market. Warning. Don’t eat too much as there are so many delicacies on the Christmas market, both sweet and hearty! You don’t want to miss out on these foods, right? 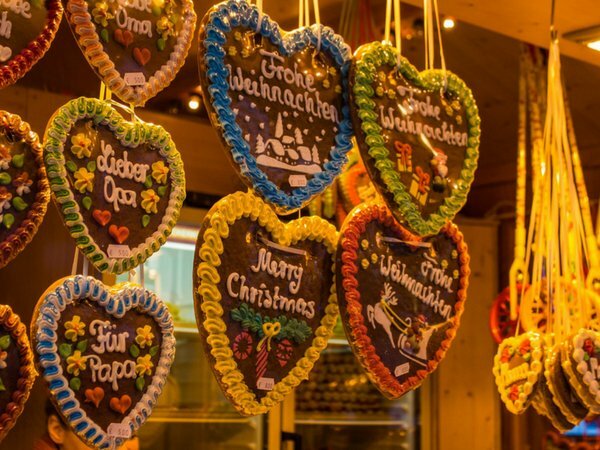 The first deli you’ll see (and smell) everywhere on the Christmas Market in Germany is Lebkuchen, or gingerbread. I just love Lebkuchen. I only wish they had these hearts without the crunchy sugar decoration. Maybe I should make gingerbread at home! For disclosure, German gingerbread is soft and chewy. When we make spiced cookies we use another spice mixture similar to gingerbread spices and make sugary crunchy cookies called Spekulatius. Anyhow, I love both. 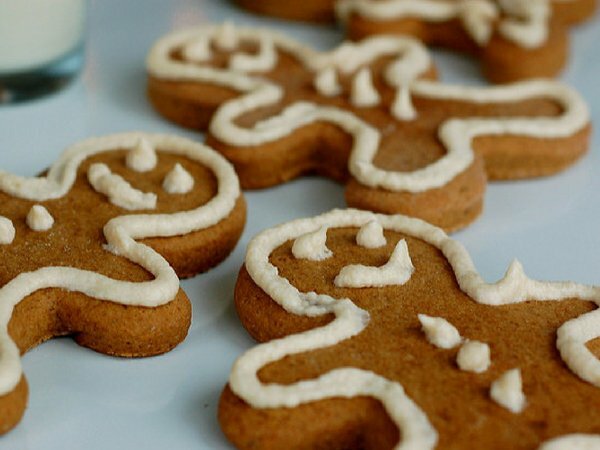 Vegan and gluten-free Gingerbread cookies, a recipe shared by Vegannie. Some folks will be so grateful to have their gingerbread men back!! 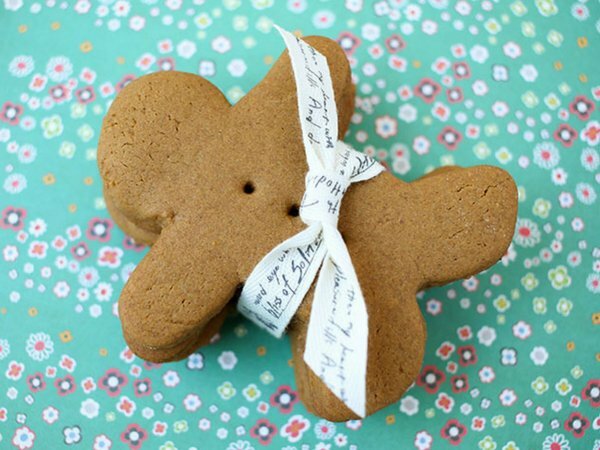 This Gingerbread cookie recipe by My Poppet is quick and easy! 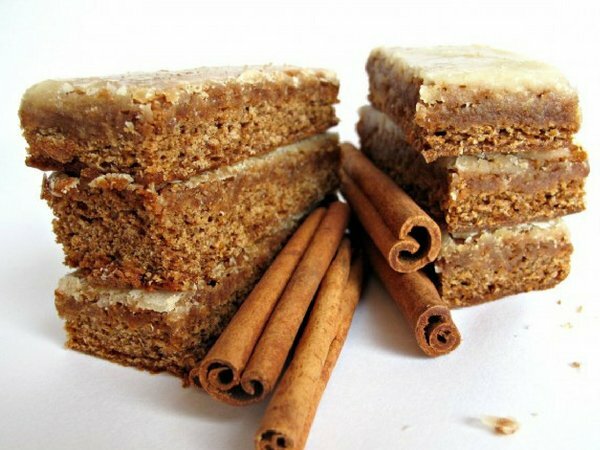 Vegannie has another vegan, gluten-free, oil-free, sugar-free, and even low-calorie gingerbread cake bars recipe here! These chewy German Cinnamon Ginger Lebkuchen bars with orange-ginger-glaze by The Monday Box remind me of the famous Nuremberg Lebkuchen. 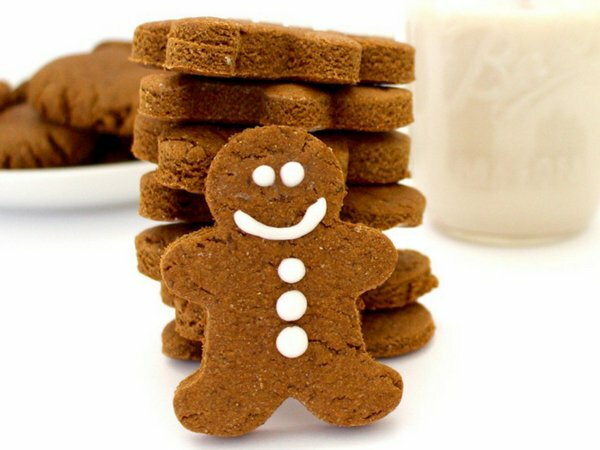 Another gluten-free Gingerbread cookie recipe for the good old gingerbread men is shared by Raising Generation Nourished. 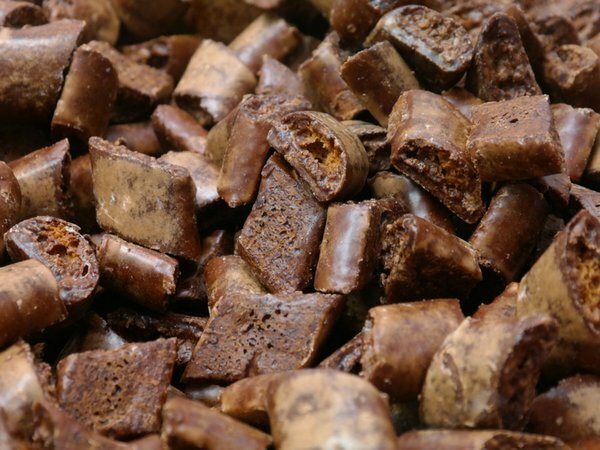 Crunchy Gingerbread Biscotti are usually not to be found on a German Christmas Market. 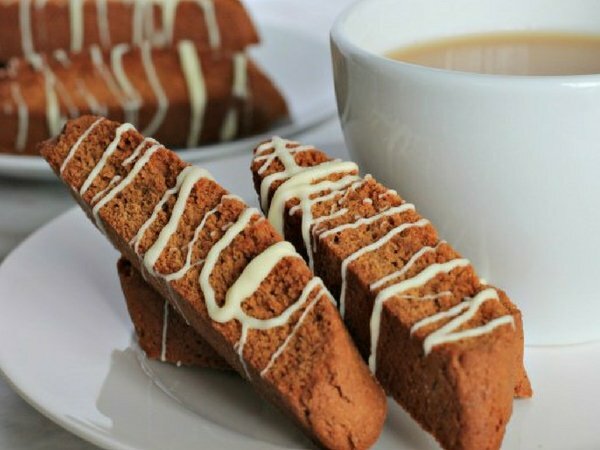 But if you love biscotti this might be the holiday treat for you. Recipe shared by The Olive Blogger. 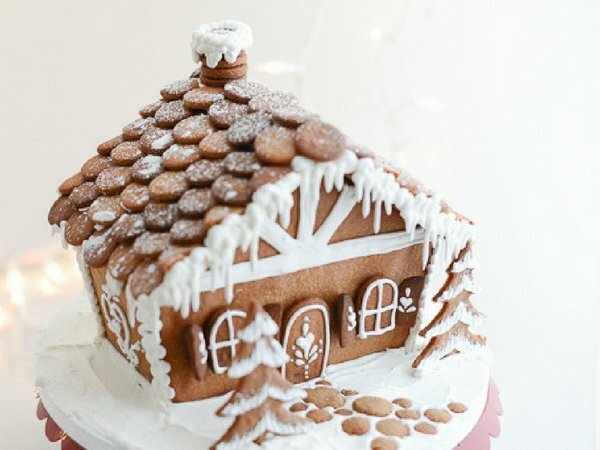 Once, and once only I was given a gingerbread house when I was young. And I even had to share it. But it’s still a vivid memory. I loved this gingerbread house. Not enough though to not eat it. But still. If you want to give someone special a special tasty gift this season learn how to make your own gingerbread house, with printable templates for cutting the pieces, at Tikkido. If your kiddos are anything like little me (or adult me) you will be their hero if you put a gingerbread house together. Just make sure to “glue” some sweets to it, too! Some strange generic gingerbread is Swiss Magenbrot (translates to stomach bread), a recipe to make your own can be found here at MarliesRecipes. 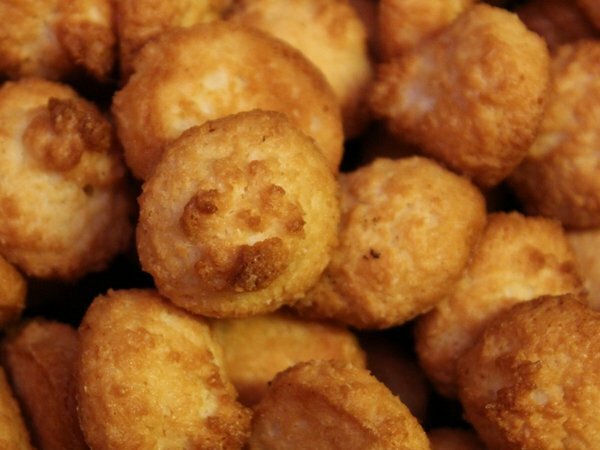 This food is to be found in (probably) every Christmas Market in Germany. You will find many booths that sell Christmas gifts, such as decoration, nutcrackers, wollen scarfs, and such. But I always skip these. Instead, I invest in tons of sweet stuff to take home. I love almond truffles that I can only find in our local Christmas Market! 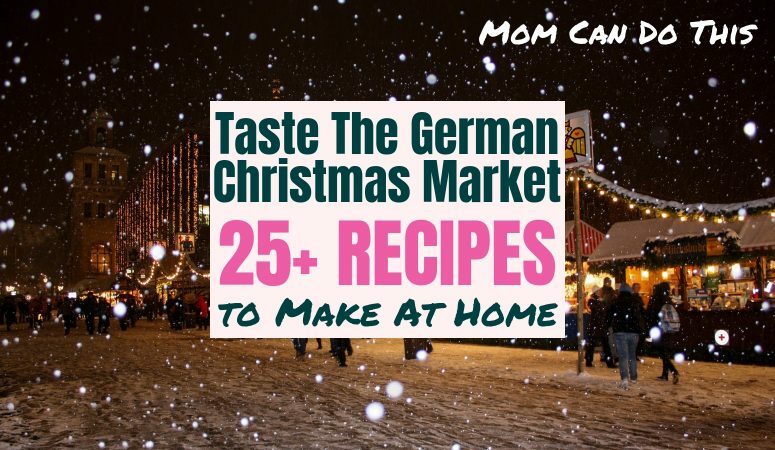 Why not impress everyone on your gift list with homemade German Christmas Market inspired food gifts? 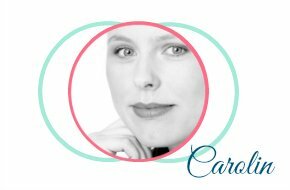 The Olive Blogger shares a recipe for homemade Chocolate Caramels, just 3 ingredients needed. Fudge is also a nice treat and gift to take with you. 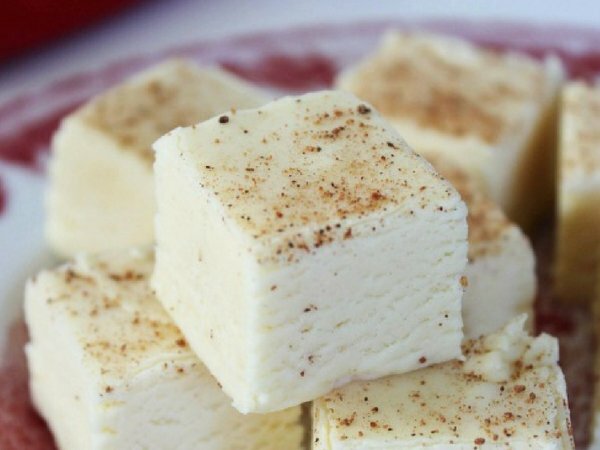 You can make your own fudge with the Eggnog Fudge recipe by Thrifty Jinxy. 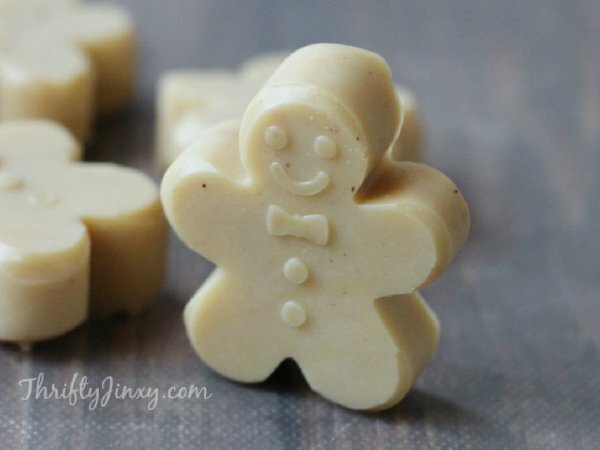 Aren’t these gingerbread man shaped fudge pralinés adorable?? I love them and really need to find the gingerbread man mold ASAP! 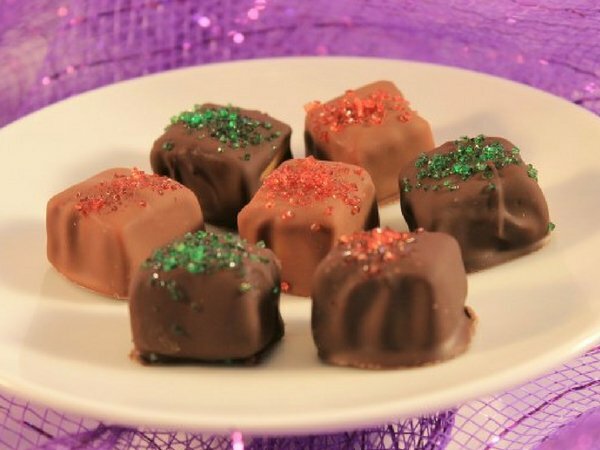 Get the gingerbread fudge recipe here at Thrifty Jinxy. Talking about adorable food gifts: This is one of the cutest I have ever seen! 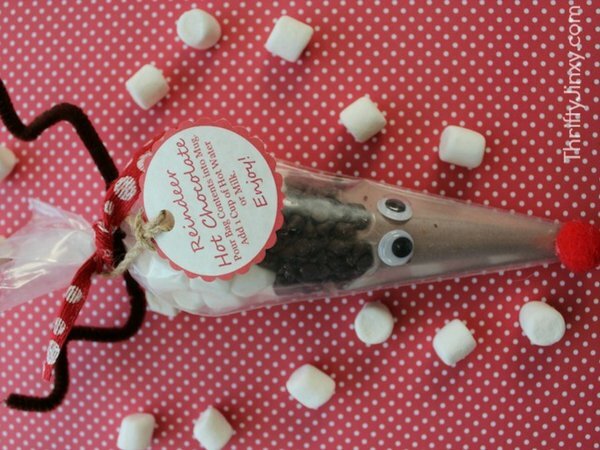 Learn how to make the uber-popular reindeer hot chocolate gift kits at ThriftyJinxy. 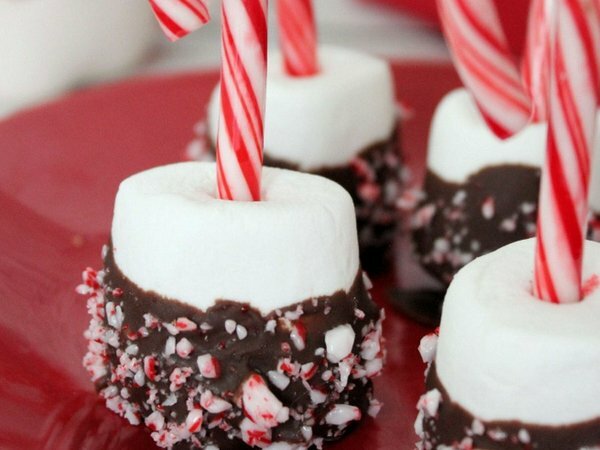 This is another cute DIY Christmas gift from the kitchen: Candy Cane Marshmallows by Mom Foodie. 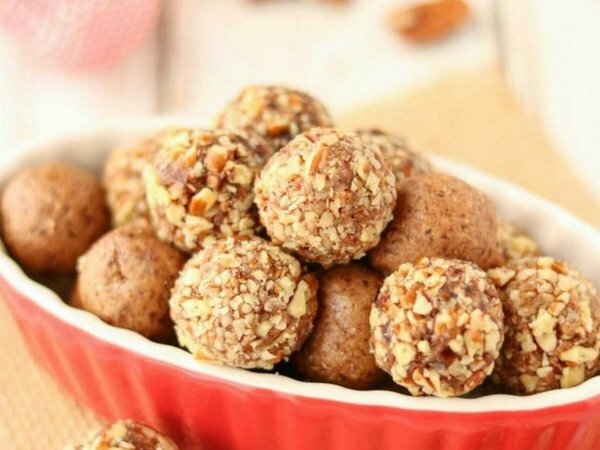 These homemade no-bake date balls by Two Healthy Kitchens also make a great DIY gift and are gluten-free paleo-friendly sweet treats. Another favorite of mine: Coconut Macaroons. Learn how to make them at home at Once Upon A Chef. Did you know that coconut macaroons are a traditional Christmas cookie recipe in Indonesia? So, we have a German-Indonesian Christmas treat here. World food. After strolling the Christmas market in the cold it will soon be time for a hot snack. Sausages, fries, and cheese bread are very popular. But I like baked potatoes best with sour cream sauce. If you don’t fancy waiting for a huge potato roasting in your oven for hours you might prefer crunchy German fried potatoes with the famous sour cream sauce. 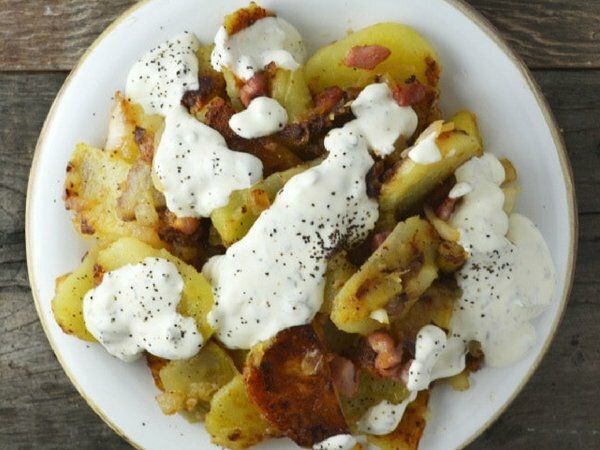 Emily of Inside The Rustic Kitchen created this recipe for Fried Potatoes with Sourcream sauce after missing this treat from the Edinburgh Christmas market. 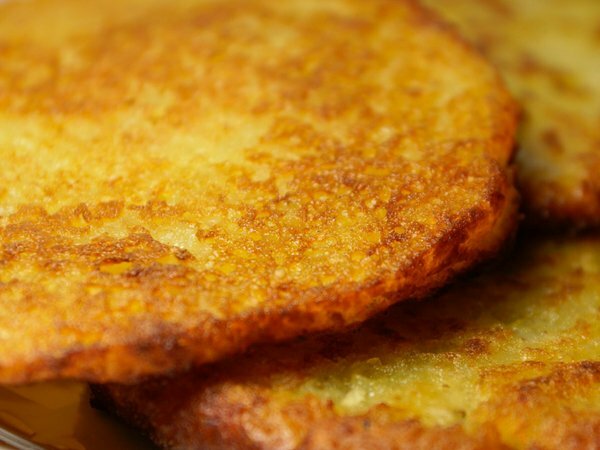 Another great hot snack are Reibekuchen, the German version of hash browns. 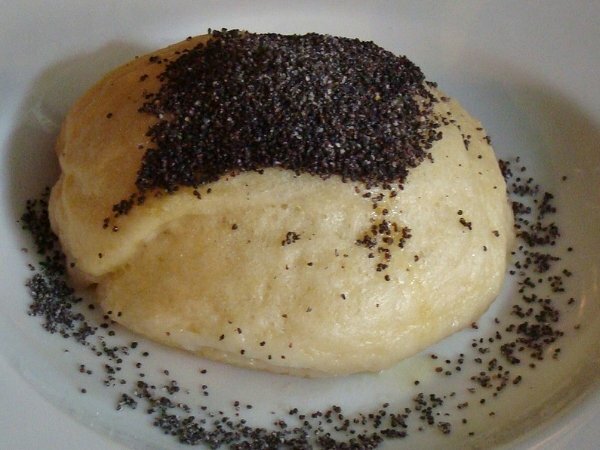 They are usually made by scooping some potato dough into a huge bowl of boiling oil. So, oily they’ll be. While some people swear by oily Reibekuchen, I don’t really fancy them. 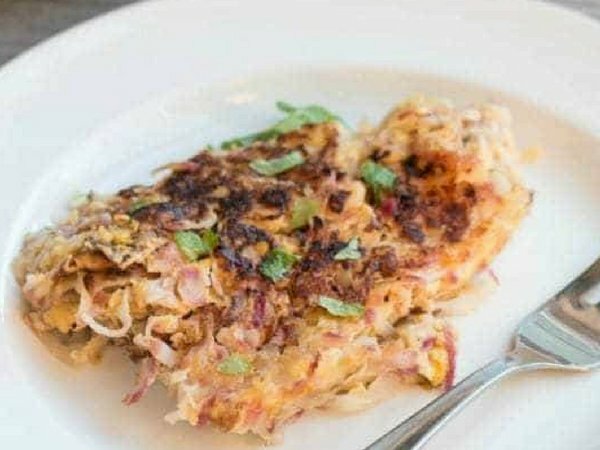 Instead, you could try these healthy low carb radish hash browns, a recipe shared by Low Carb Yum. And yes, I said healthy. Christmas Market inspired recipes can be healthy. Sweet tooth? No worries. The German Christmas market offers a ton of desserts and pastries, freshly made. For example, crepes, waffles, churros or .. Instead of Germknödel, I want something more tasty: Churros! They are newbies on the German Christmas market. They appeared some years ago and were not there when I was young and hungry. Nevertheless, I’m a fan of fried pastries! But I rarely make them at home. Too much hassle. 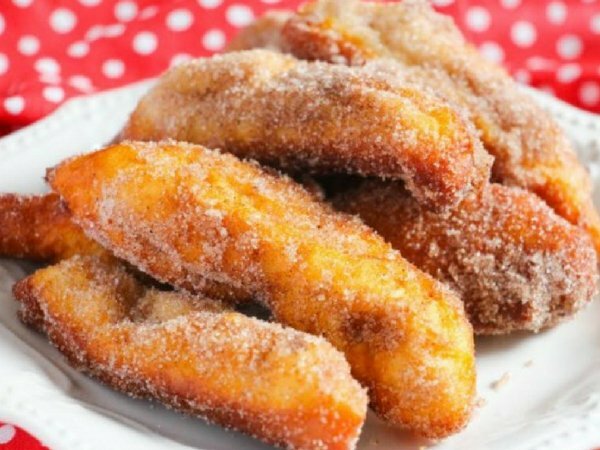 If you want to make churros at home but you fear the hassle and mess, try this shortcut recipe for Easy Homemade Churros by Thrifty Jinxy. Candied nuts!!! So good, so tasty, so crunchy! Oh, candied nuts, you are so good and my very favorite treat on each Christmas Market … as well as any place I find you in. 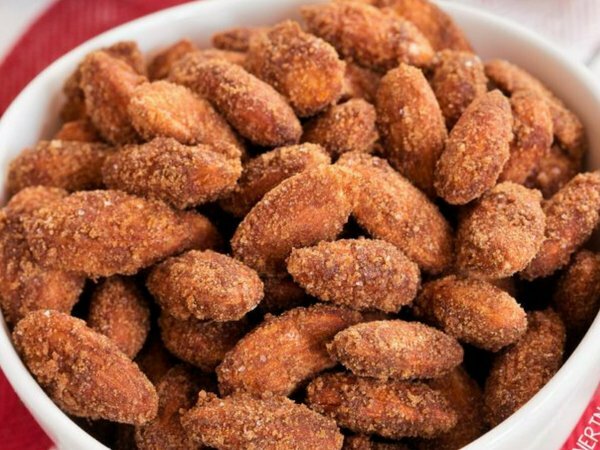 You can easily make them at home, a recipe for candied almonds is shared on AllRecipes. You can make them in the microwave, too! Super easy. Throw everything in a heat-proof bowl and heat. Check often and mix until sugar is melted and nuts are candied well. They also keep fresh so get a ton of them. Or make a large batch of candied almond as a treat for yourself and others. 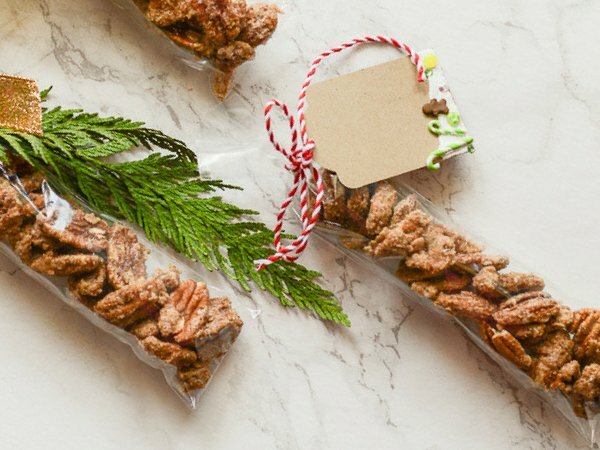 Learn how to make Gingerbread Spiced Candied Nuts at Tikkido. 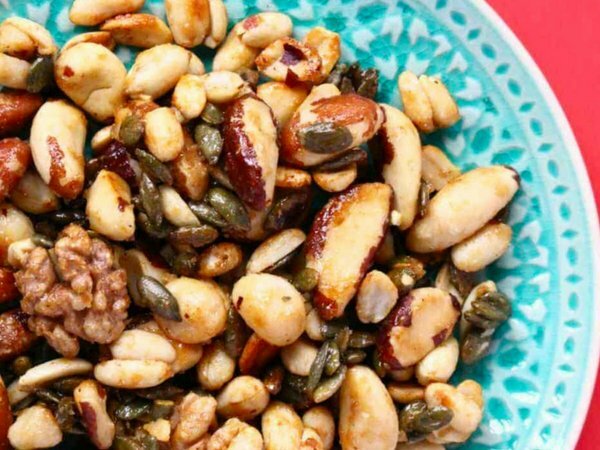 Paleo Vegan Candied Nuts by Texanerin is another option. 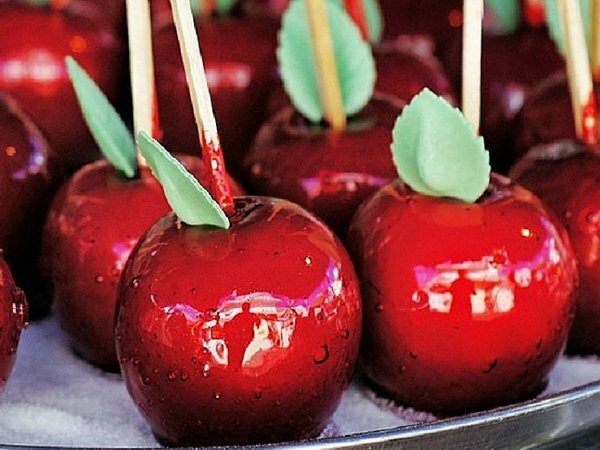 And how beautiful those glossy candy apples are! They have the glossy red ones on the German Christmas Market. They were the only option when I was little and I LOVED them! They look so nice and taste so sweet. I could lick on one for hours and would never ever chew the candy crust. Today, they have chocolate covered apples, too, black, brown, white, sprinkled. Whatever you may fancy. Different fruits, too. They sure are a tasty treat. Beverages on the Christmas Market are hot! In Germany, mulled red wine, Glühwein, is ultra popular. Many Christmas markets have a unique set of mugs for each season that some people collect. (Althought they are most often ugly if you ask me.) 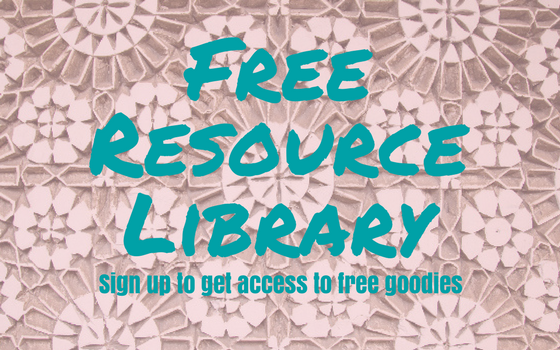 Nowadays, there are many great booze-free options, too. There is mulled hot juice or spicey hot chocolate. 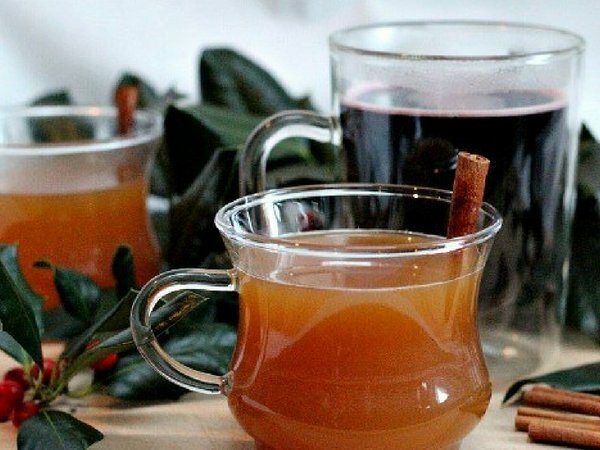 Traditional English Wassail Hot Mulled Cider, shared by Pink Fortitude. I love to use apple and cherry juice! 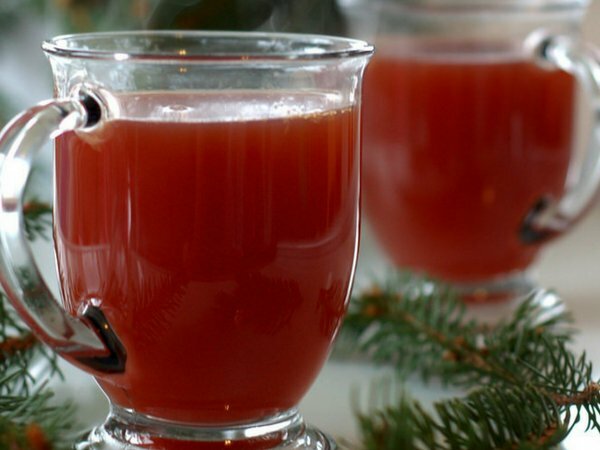 Here is another Wassail recipe for mulled juice based on apple cider and cranberry juice, shared by Raising Generation Nourished. 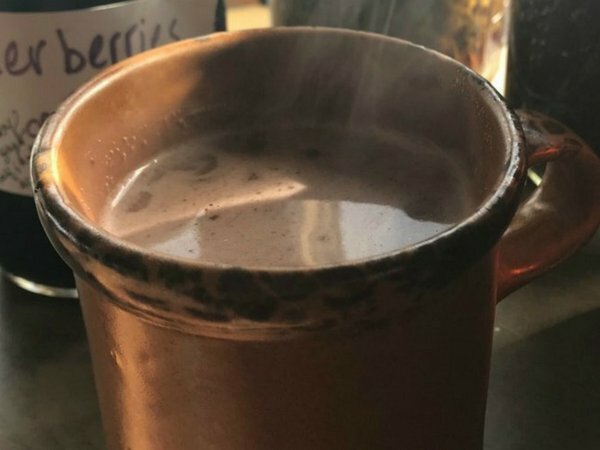 Spiced Hot Chocolate by Healing Harvest Homestead is made with cocoa and includes a Keto option, too. If you prefer Hot Chocolate made with chocolate, check out my recipe for homemade hot chocolate here. Travel blogger Amanda from Ohio shares her experiences with German Christmas Markets and the 5 Must-Do’s here on her blog. It’s so worth reading! Even I, who goes to see the Christmas Market herself every year ever since, devoured it. 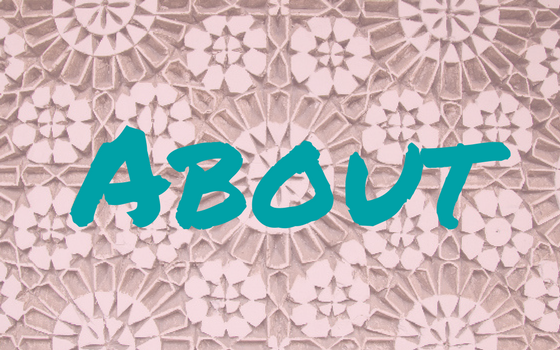 So, be sure to check it out. She also shares a picture of her collectible market mug and says, some of them were “beautiful and festive“. 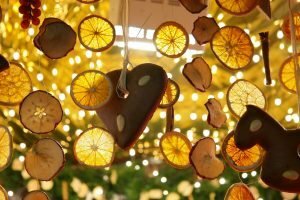 Even more in depth is this guide to German Christmas markets by travel blogger Annemarie that even has a guide to download and take with you. 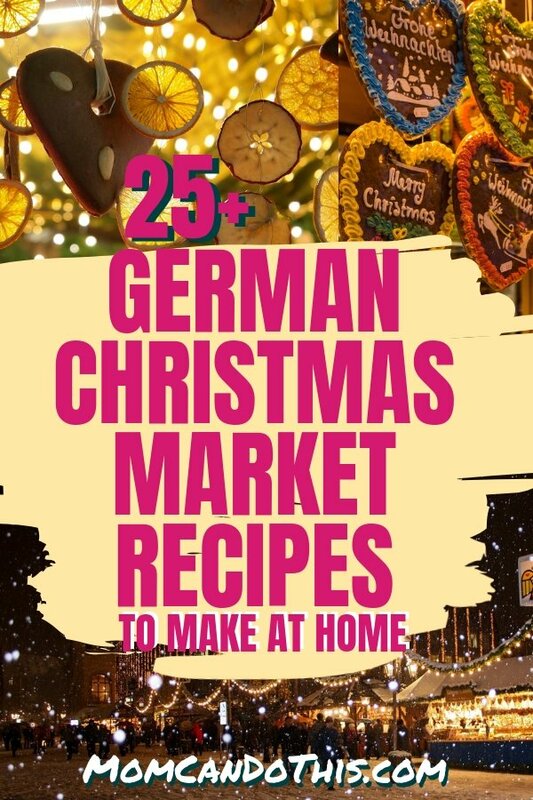 So, now you not only know what a German Christmas Market is, but you can also germanize your holiday food with these lovely recipes! Enjoy Christmas in Germany… in your home. Woah. Did this post all of a sudden mushroom into a 30+ (thirty!) picture odyssey?? Well, I guess this topic had to go down like that! Let me know, what is your Christmas favorite? Pin This Image, please! 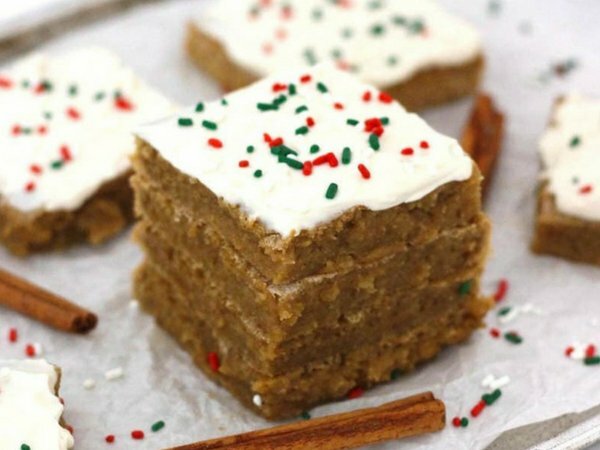 Share the love for yummy holiday treats with your peeps on Pinterest. Come back for later reference. Pin This Picture to Share the Love For Tasty Christmas Food!